“As visionary as Obama is, he is hamstrung by his pragmatism.” So says Michael Marx of the Sierra Club, America’s largest grassroots environmental organization. It is therefore “incumbent on our movement,” Marx continues, to press the president to be more visionary than pragmatic during his second term—above all on climate change, the make-or-break challenge for our civilization. One way to push Obama is through “a show of force,” Marx says, by turning out large numbers of people at two big climate demonstrations planned this year in Washington. The rallies, on Presidents’ Day weekend (February 17) and Earth Day (April 22), will bookend a 100-day Obama Climate and Clean Energy Legacy campaign intended to press the president to show much stronger environmental leadership in his second term. Pragmatically, activists are urging Obama to use his executive authority and take immediate actions, which he can do without approval from congressional Republicans who refuse even to acknowledge the existence of climate change, much less move against it. These actions include the cancellation of the Keystone XL pipeline; Obama’s decision on the pipeline, currently under review by the State Department, is expected this spring. Activists will also be pressing the administration to use the Environmental Protection Agency and the Clean Air Act to slash US greenhouse gas emissions, with different groups pushing for a range of approaches (more on these below). Of course, protest marches are a dime a dozen in Washington. Even so, the Obama Climate Legacy campaign seems worthy of attention, if only because it is being sponsored by two groups that have accomplished something rare among environmental organizations over the last four years: they won. Both the Sierra Club and 350.org, its partner on the Washington demonstrations and the Climate Legacy campaign, scored major victories in the climate fight during Obama’s first term. 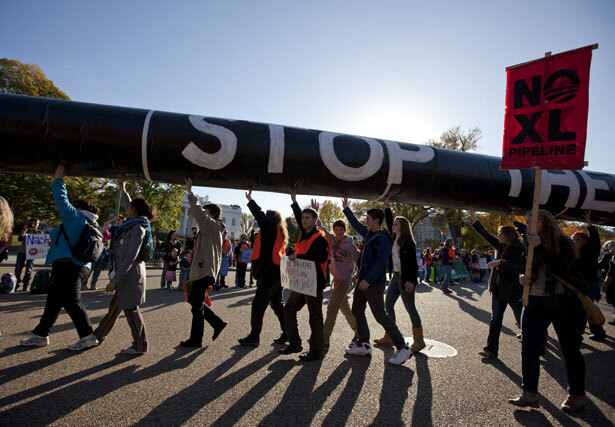 It was 350.org, a group co-founded by writer Bill McKibben, that galvanized grassroots opposition to the Keystone XL pipeline, the construction of which would light “a fuse to the biggest carbon bomb on the continent,” in McKibben’s words. Days after 350.org brought more than 10,000 people to literally surround the White House in November 2011, the Obama administration reversed course and delayed a decision on whether to approve it. As for the Sierra Club, while most big green groups were demanding that all environmentalists stand and salute the god of cap-and-trade—the Obama-backed legislation that went down to ignominious defeat on Capitol Hill in 2010—the club was collaborating with grassroots activists across the country to impose a de facto moratorium on new coal-fired power plants. As I described in Mother Jones, the Beyond Coal campaign helped prevent 174 (and counting) new coal plants from coming on line, thereby limiting America’s future greenhouse gas emissions nearly as much as the cap-and-trade system would have done (and that assumes the system functioning as well as its proponents had claimed—no sure thing considering how badly the bill was weakened in the congressional horse-trading). As important as the victories themselves was how they were won. Both the Sierra Club and 350.org eschewed the inside-the-Beltway focus and top-down political strategy of big mainstream environmental groups, as exemplified by the cap-and-trade campaign. Instead, they emphasized grassroots organizing at the local level on behalf of far-reaching demands that ordinary people could grasp and support. Their immediate goal was to block a specific pipeline or power plant, but their strategic goal was to build a popular movement and accrue political power. Without power, their thinking went, the best policies in the world were doomed to defeat, for a policy’s intellectual merits alone could never persuade politicians to cross the richest business enterprise in history, the fossil fuel industry. Progressive organizations have talked in the past about uniting in pursuit of common objectives, but those efforts usually fizzled. This time it’s different, Radford says: “We’re focused on having a really powerful ground game. We didn’t invite anyone that didn’t have field organizers and a substantial [membership] base.” And the intent is to play hardball. The Democracy Initiative will not merely seek to gain access or befriend politicians, a mistake that progressives have often made in Washington; instead, it says it intends to punish or reward politicians depending on how they vote and govern. This resolution will be tested now that the most recent push to reform the Senate rules fell flat, after Senate majority leader Harry Reid reneged on his pledge to fix the filibuster in late January. Grassroots organizing is also central to a crucial battle against climate change that has yet to receive national attention: the campaign to block coal exports from ports in the Pacific Northwest. Coal is the most carbon-intensive of the conventional fossil fuels, and the West, especially Wyoming, holds plenty of it. Coal companies are eager to sell to China and other booming Asian economies, but that requires transporting the coal by rail to the Pacific coast as well as constructing terminals where it can be transferred to cargo ships. Policy expertise has its place, however, and Lashof, the director of the NRDC’s Climate and Clean Air program, has produced a new blueprint for how Obama’s EPA can use the Clean Air Act to cut greenhouse gas emissions. (There is a great irony here, because the cap-and-trade bill that the NRDC and most other big environmental groups championed would have stripped the EPA of regulatory authority over coal-fired power plants under the Clean Air Act.) The new NRDC plan would deploy the act primarily against the roughly 1,500 existing power plants in the United States; of those 1,500, roughly 500 are coal-fired, and they account for 40 percent of the nation’s greenhouse gas emissions, not to mention thousands of deaths, heart attacks and asthma cases every year. (To be clear, the Beyond Coal campaign is focused on blocking new coal plants.) The EPA would work with state governments and utility companies to find cost-effective ways to scale back or shut down many of these 500 plants. Replacement power would come from improving energy efficiency and increasing solar, wind and other renewable sources, as well as some natural gas. The electricity sector’s greenhouse gas emissions would decline by 26 percent by 2020. If the EPA does issue tough new greenhouse gas rules, congressional Republicans will doubtless try to block their implementation, but Obama could overcome them. Indeed, this scenario played out twice recently, when the EPA issued rules on coal plants’ mercury emissions and then on their interstate air pollution. Under the Congressional Review Act, explains Nathan Willcox of Environment America, the Senate can block any rule promulgated by the executive branch with a simple majority of fifty-one votes. In that case, however, the measure goes to the president, who can veto it painlessly, for such measures cannot be attached to other legislation. Opponents would need a two-thirds majority of the Senate—sixty-seven votes—to override the veto. In short, Barack Obama already has it in his power to slash greenhouse gas emissions and thereby limit the damage climate change inflicts in the years ahead. But will he exercise that power? Activists can pressure him and appeal to his legacy, but in the end, the choice is Obama’s to make. And the activists are right: future historians—if there is a future on this rapidly overheating planet—will judge him accordingly.